On a carpool that changed the course of history in Northern Ireland. When Nick Hamm set out to make a film regarding the Troubles, the devastating, all-consuming four-decade conflict between Protestants and Catholics in Northern Ireland that often led to violence in the streets of Belfast where the filmmaker grew up, he knew exactly what he didn’t want to do. 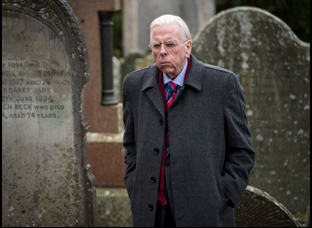 It might not seem that way from the start of “The Journey,” which finds the fiercely opposed Ian Paisley (Timothy Spall), the devoutly Protestant leader of the Democratic Unionist Party, and Martin McGuinness (Colm Meaney), a former member of the Irish Republican Army who had risen to become the chief negotiator for Sinn Fein, as they break off talks facilitated by the British government in Scotland in 2006 to work out a framework for a united government. But Hamm and screenwriter Colin Bateman hone in on the moment that the two begrudgingly broke the ice just thereafter, traveling together to the airport where Paisley was set to depart for Edinborough to celebrate a wedding anniversary for his wife. 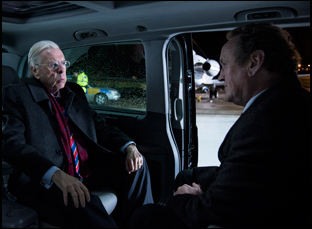 Though the creative duo were unaware of exactly what happened during that conversation, they knew the end result, which was that Paisley and McGuinness came to an agreement in which they would serve as First Minister and Deputy First Minister, respectively, and “The Journey” imagines what the pair may have said in transit to overturn decades of vitriol and strife. 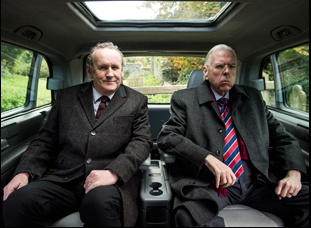 With a visual dynamism to match the tête-à-tête between Paisley and McGuinness, “The Journey” may rarely leave the confines of a van as it rolls out of the peace conference in St. Andrews, but continually feels as if the weight of the world rests on every word and gesture made. 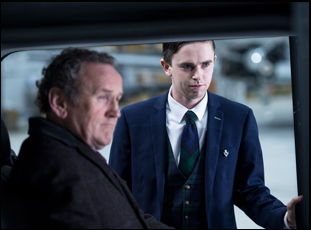 While some cinematic sleight-of-hand is involved, namely pulling out occasionally to see the machinations of a wily M:I:6 agent (John Hurt) watching the conversation unfold from afar on a live feed and feeding lines to the pair’s chauffeur (Freddie Highmore) to steer the conversation when Paisley and McGuinness’ frustrations lead to silence, the steady stripping away of political posturing to find common ground feels both genuine and refreshingly hopeful. After turning heads internationally last year by doing the Venice and Toronto Film Festival premiere two-step, “The Journey” arrives this week in America and while in Los Angeles recently, Hamm spoke about discovering the unlikely way in to tell a story close to his heart, how much effort went into rigging a single car in order to film inside, and seeing the film become a rare point of agreement on both sides of the political spectrum. It came about because I found out that [when] Northern Irish politicians over the years of the Troubles traveled together abroad — to England or anywhere else — even though they hated each other, sometimes they would often go in the same form of transport, to avoid either side shooting them down, and the idea of forcing politicians from different political constituencies in close confines was actually an interesting idea for a movie. Then I found out about this one particular journey that took place during the peace process where two particular politicians shared a private jet back, and I wanted to dramatize that story of those two guys anyway because that was a pretty unique political relationship. That’s really the equivalent of the head of Hamas and the head of Israel saying, “Let’s get on,” so it was two people who have totally conflicting views actually coming together, so I used the idea of the proximity of the journey to tell the story of their friendship. It’s a van ride in the film as opposed to a private jet. How did that open things up? I didn’t want to set the whole movie on a private jet because I thought that was going to be really boring for everybody. You couldn’t cut outside of it, you couldn’t have any landscapes, you couldn’t breathe. So I needed to move the two of them into the car and the actual journey from that airport to that air field is no more than an hour, so I used the British government as a source of interference in the linear nature of that journey and got them to make their journey frustrating and longer and longer, so that they were forced to get on together. What I was really doing was telling the story of a relationship between two men almost like an ugly aversion of “The Odd Couple,” diametrically opposed politically and in every single way that they thought about life who actually in real life who formed a real friendship and helped the cause of peace in Northern Ireland. To do that, I had to synthesize that into an hour-and-a-half film, and I didn’t want to do it as a biopic. You have to fit a lot into the set-up, both aesthetically and narratively. How did you go about it? First of all, I wanted to make it quite authentic. We’re all used to heightened political dramas and I think some times what they do is they allow the audience of the hook because they’re slightly more interested in the entertainment than they are in the actuality. Something absolutely real is that when they did the peace talks, the two opposing organizations never sat in the same room ever. No one knows that. If you’re going and having a peace conference, you think you’d sit like you and I are right now across the table. The British government would go in one room, and they’d have to swap over [with the other parties]. So [in that first scene] I wanted to show how diametrically opposed they are and also establish that it was comedic, that you could feel free to laugh at this. The language of the movie is not too heavy. Then when I got into the car, I wanted the audience to have that sense of claustrophobia that the people in the car would actually have for the first 20 minutes of the movie and juxtapose [that] with the extreme beauty of the outside. That’s why you have these very tight but wide-lensed shots inside the car, so the depth of field is long, but also you’re very close to the action, and to relieve the audience every now and again, you cut back to the hotel, you cut back to the Scottish landscape that you’re driving through, which allowed to tell the story quite quickly. The body language between the two actors make this so that you could turn the sound off and still understand what’s going on — how did you work with the actors on that aspect of their performance? Before we shot, we did a lot of rehearsal and we also did a lot of long takes. I shot all the car stuff in narrative order, which I wanted to do that so as the actors got to a decision, they could move forward, and then the guys worked very closely on the characterizations, so Tim had a prosthetic chin and he had false teeth put in that made him talk in a certain way and behave in a certain way. But let me say for the car, we designed a kind of mobile studio and we took over a whole stretch of freeway and closed it down in Northern Ireland. We had a convey of cars, so that the hero car [carrying the actors] had the two guys in it and the cameramen were there in the car – one fixed camera and one operator, and it was rigged with lights and it had its own microclimate so we could make it rain whenever we wanted to inside their vehicle. And their signal was beamed to me, relaying the pictures — I was either in front in another car or in a van with all the sound and the monitors — so I could direct from one car to the next through signals. Then in front of us then was sound and in front of them was the police, so we had a “Mad Max” convoy of crazy people going up and down this freeway in order to just shoot two people in a car. [laughs] But I wanted to make sure I could [make] the changes in the car and the boys would sometimes we would do two pages or three pages in one long take. Then [we’d] switch the cameras and do another long take, then switch the cameras and do another long take and they would stop sometimes mid-take if they weren’t going to get it right. So being a bit of a svengali from another location, you and John Hurt were playing a similar role. That’s a very good point. [laughs] John Hurt and I were literally in the same world of manipulating the world around us. Correct. How did he come into the mix for this, so close to what wound up being the end of his life? Was there a particularly tricky day of shooting on this? The movie was a real delight to shoot, to be quite honest with you. But the trickiest times were in the beginning when we were doing the car because [besides] how we all organized ourselves as I told you, we also shot in some pretty horrible weather and the police wouldn’t allow you to go out if it was foggy because it cuts down the view and the driver’s only got about 10, 20 feet of visibility. So sometimes we’d go, we’d all load up and there’s maybe 60 people in this convoy and there’s police outriders at the front and at the back and you’d sit, waiting for fog to life at six in the morning in a field in Ireland and it sometimes doesn’t lift until 12. Those days were really hard because you still had to make your day and the actors want to shoot, but by and large shooting because the guys were so particular and so clean and simple in the way they approached everything, it was a joy. What’s it been like to see the reaction to this film? Starting in Venice when the movie’s subtitled into Italian and you see a thousand people start laughing immediately and applauding and then to take it to Toronto [a few days later] and see the Canadian reaction the same way was extraordinary, and about four weeks ago, we opened the movie in Belfast to the local, homegrown Irish audience and it was very emotional because there were people from both sides of the community who were part of that struggle and part of the conflict that came to the opening of the film. I understand Martin McGuinness may have actually been able to see this before he passed away in March. Yes, he did and we’ve heard from his family that he was very comfortable with his portrayal in it. He thought it was fiction, but we heard from members of his family and people around him and Sinn Fein, his political party, who have been very supportive of the film, as have the Protestants. So you’ve got this rare moment where these people are agreeing about a work of art, even though they can’t agree about anything else. “The Journey” opens on June 16th in New York at the IFC Center and the Lincoln Plaza Cinemas and in Los Angeles on June 23rd at the Pasadena Playhouse 7, the Royal and the Encino Town Center 5. Seattle Film Fest '17 Interview: Jenée LaMarque on Giving All "The Feels"